At long last, Jorge Masvidal is set to return to the cage. The fan favorite welterweight contender will battle former title challenger Darren Till in the main event of the anticipated UFC London card on March 16. Speaking on the latest stacked episode of BJPENN Radio, Jorge Masvidal explained how he envisions this UFC London fight with Darren Till playing out— and interestingly enough, it all ends with him slapping another UK MMA star in Michael Bisping. “I’m walking into the cage, crowd is going crazy,” Masvidal said, living out the fight in his mind. “My coach is giving me some last-minute instructions. I turn around, see Till, charge at him, and we start throwing down. I hit him. I make him miss. I take him down. I punch him in the face. He gets back up. I punch him in the face some more. I keep making him miss, punching him in the face. Then I just break his will and take over and just keep coming at him, getting my hand raise at the end of the day for a lot of hard work, skillset, and determination. Jorge Masvidal and Michael Bisping have been swapping trash talk for years, and for the former, the beef is still alive and well. He’s still dying to get the British MMA legend alone. 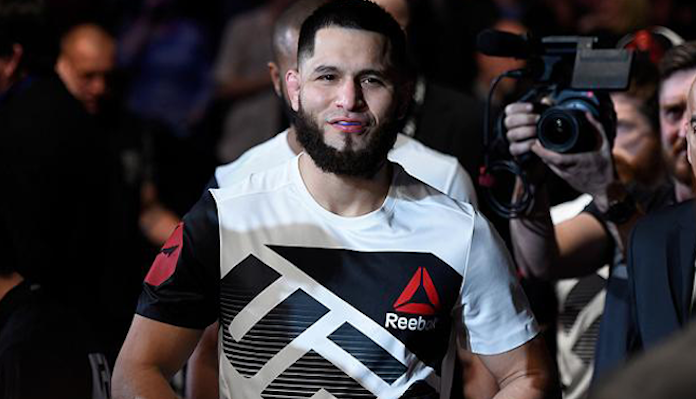 How do you think Jorge Masvidal will perform against Darren Till? And what do you think will happen if he crosses paths with his nemesis Michael Bisping after the fight?